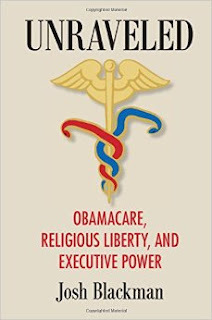 “Unraveled: Obamacare, Religious Liberty, and Executive Power” is a comprehensive book on Obamacare with in-depth discussions about the issues that led some groups to support it while others vehemently opposed it. The book is expertly divided into eight (8) sections making it easy to follow and comprehend. Given the limited knowledge I had about Obamacare prior to reading Josh Blackman’s book I found section I-IV most useful for my purposes, as these sections gave an excellent overview of both legal and political issues related to Obamacare. The first section “The Promise of Obamacare” discusses the birth of the bill and the legal issues that plagued it almost immediately. Part II “Conscience and Contraception” is probably one of the most interesting chapters with a focus on the controversial issues of abortion, contraception and the initial rejection of Obamacare by pro-life democrats. Part III “shutdowns discusses Obama’s difficulty with the implementation of Obamacare and the problems surround the HealthCare.gov. website, while Part IV focuses on the time period between October 1st 2013 and December 30ths 2013 with a deeper look at the technical difficulties surrounding HealthCare.gov including the fact that only six (6) people were able to register on the first day that the website was launched. As a criminal defence lawyer and a human rights advocate for me the most fascinating aspect of “Unraveled” was the deliberation surrounding the freedom of religion debate including the case law that was reviewed in detail and helped shed light on the issue as a whole. I would highly recommend this book to anyone who is interested in Obamacare, even those with very limited knowledge, as Josh Blackman has managed to write a book that is both detailed, comprehensive and at the same time easy to follow and understand. I was provided with a copy of this book for the purpose of review.